Comfortable apartment set in the heart of Rome, in Campo de' Fiori, walking distance from major city sites such as Largo Argentina, Piazza Navona, The Pantheon, near transports that will allow you to reach the other parts of the city, near shops and restaurants. with two patio doors onto the terrace . Equipped with a three seater sofa (which can become a bed for 1 person), a table with chairs , a wardrobe - cupboard , shelves, tables, lamps, air conditioning , TV, Internet (WI - FI) . overlooking the living room but separated by a wall. Equipped with cutlery, crockery , pots for 3 people . Microwave oven , fridge with freezer, toaster , drying rack , ironing board and iron. Small but with two windows (one overlooking the roof , the other on the terrace ) closed by curtain, wardrobe, double bed , bedside tables. which can be accessed with just a few steps from the bedroom. With bath (with shower) , bidet, sink. A wall of mirrors hiding a closet to store your bags . of 14 sqm is furnished with table, chairs, armchairs , plants. From here you can enjoy a view over the rooftops , on terraces surrounding and to the square of Campo dei Fiori , as well as magnificent sunsets. Independent heating, AC, cable TV, washing machine, microwave, safe, hair dryer, terrace, no elevator. The apartment is located in Via de' Balestrari, right in the heart of Rome’s historic centre, a zone bustling with life and activity, and a mere stone’s throw from historic Campo di Fiori. Nearby are Piazza Farnese, Piazza Navona and Largo Argentina . Young people swarm in the busy taverns with the police nearby, keeping a watchful eye! In the daytime the magnificent fruit and vegetable market is thronged, as are the many trattorias and resturants. Via de' Balestrari means ‘Street of the arch-makers’, and there is a plate in latin hanging high up on a wall, dated 1483, thanking Pope Sixtus IV for having done a ‘wonderful clean-up job to the street’! The apartement itself is 50 square metres in size, 4th floor. No elevator, filled with light, and suitable for a couple. Independent heating. SITTING-ROOM: 2 glass doors lead on to the terrace, sofa seating two. A table with chairs, cupboard, table, armchairs, lamps. Air-conditioner, TV, internet(WI-FI). KITCHEN equiped for 2 persons. With freezer, wash machine, microwaves bakehouse, toaster, flatiron. BEDROOM little but with 2 windows, ( one with view of terrace), double bed, cupboard. BATHROOM is reached from bedroom by going down a few steps. Bath with shower, bidet, basin. A mirror conceals storage space for luggage. TERRACE, 14 square metres, with table, chairs. Views of roof-tops and of Campo dei Fiori. Magnificent sunsets. The air conditioner will save your life in July. The location is amazing and the host was very helpful. The terrace could have been much nicer,— it has a lot of potential! The kitchen had everything we needed. The apartment is at the top top floor of the building, so be prepared to walk heavy Roman stairs up and down a couple of times a day. The bathroom was okay with both hot and cold water, although very weak water coming from the shower. Overall good, but if it was my apartment I would really invest in it because it has a lot of potential but it feels like no one really cares for its development. I would recommend this apartment for anyone that doesn’t expect too much and wants to live in the best location in Rome! I stayed at Alsa's place for 6 nights in June 2018 and it was a really great find. The location is amazing, just moments away from Campo dei Fiori and all the main tourist attractions of Rome are within walking distance. It’s also very convenient for evenings out in Trastevere and there are lots of amenities on your doorstep. The apartment was very clean and the terrace is wonderful for enjoying the evening sun and an aperitivo. I would thoroughly recommend it and hope to come back soon! Thanks for a really great stay, Elsa. We had an amazing time and loved your apartment, especially the terrace. Lavinia was also very helpful when we arrived. This is a wonderful apartment. The terrace is beautiful and private. The fan kept me cool for most days and the air conditioning unit came in handy a couple of days. The internet is good and stable which helps when one has work to do or people to contact on the other side of the world. Having a washing machine was a wonderful help. I used the drying rack on the terrace and found it all very convenient. The location of this apartment is spectacular. Everything you need is right outside your door - fabulous markets, delightful restaurants, classic bars for your morning coffee. The entireity of Rome's attractions are a short walk away, or you can take the busses or even taxis which are fairly inexpensive for getting around the central areas of Rome. The metro is also easy to access - just take any bus to Termini and there they are, waiting to transport you where ever you need to go! Don't worry about the steps to get to the apartment! 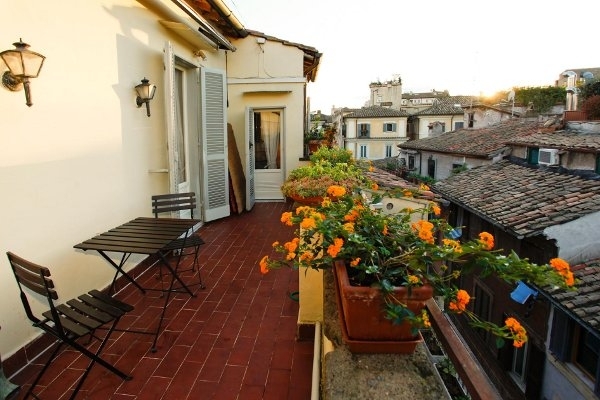 It is an easy walk-up and worth it to be overlooking the rooftops of Rome. I cannot praise Cities Reference enough. They are fast and efficient. Lavinia was a wonderful keyholder - efficient and a delight to talk with. I am looking forward to my next adventure in Rome and Cities Reference will be a part of my plans. The location for this flat is perfect. Just off campo de fiori, walkable to everything. We walked to both the vatican (about 25 min) and the colosseum (about 30). There are endless amazing restaurants and bars in the neighborhood and you are just across the river from trastevere. It is a 6th floor walkup but honestly with all the food you will be eating that is no harm! It was a little noisy one of the nights when one of the bars on the square had live music but other than that it was fine (and we were there over a weekend). Guglielmo is very responsive and helpful. The flat has everything you will need including an amazing terrace. Great apartment with an amazing large terrace. The location is perfect, especially if you like to walk everywhere. Can’t recommend this place enough if you want to be in the heart of central Rome. We loved the apartment and had a wonderful time in Rome! Location. Location. Location. Plus an amazing terrace. The apartment is exactly as described and pictured. It has everything you need and communication couldn't have been better. Highly recommended for couples. Charming, well fitted apartment. I loved the location. The landlord was awesome and kind. If you are concerned about the Campo dei Fiore noise, don't worry! I found that the apartment was quiet! The terrace was wonderful, but you will hear people in the piazza. I liked hearing the buzz of the city. Don't worry about the steps. I am an older, out of shape woman and I could do the steps easily. I just stopped once to catch my breath and all was well. Shopping in this neighborhood is wonderful. If you are looking for fine Italian wear, great food, Italian craftsmen, or just basic groceries, everything is right outside your door. We really like this apartment as well as the treatment we have always received from both Guglielmo and the owner. We have stayed here many times and, although we were sad that Enzo was no longer there to meet us, we were happy to meet Lavinia who was equally helpful. One small thing we would like to point out is the state of the carpets...the one in the sitting room is very dirty and the one in the dining area is not much better. The kitchen floor is chipped and the rag rug we simply put into the cupboard on the stoep! We also had to repair the handle on one of the pots...I tell you this not to complain but to be constructive. We really appreciated the fresh plants and, particularly, the herbs! It gave me pleasure water and weed every few days and we certainly used the herbs. Thank you for helping us to have such a good time in Rome. Owner Comments: Hi Sue, we will immediately change the rugs, thank you so very much for your feedback and for being such a loyal guest of our apartment. Enzo's warm welcome and friendly face made our arrival in Rome so much more special - thank you Enzo! The apartment is charming and comfortable, and it was everything we could have wished for. It is perfect for two, and very well equipped. The view from the bedroom is gorgeous - overlooking the surrounding terracotta rooftops - and the beautiful terrace, with its potted herbs and plants, is a dream. Being just off the Campo dei Fiori meant that we could enjoy the colourful market each morning and the lively ambience of the evenings. We hope to stay here again soon! J'ai passé une dizaine de jours dans cet appartement adorable et ultra bien placé. Il y a tout ce qu'il faut dans l'appartement, le lit est très confortable, la cuisine bien équipée, le chauffage si besoin est, le Wifi, et une terrasse très agréable, bien orientée, avec vue sur les toits de Rome. La place de Campo dei Fiori, avec son marché tous les jours, est à vingt mètres, et pourtant l'appartement est très calme. Je ne peux que chaudement recommander ce petit coin de paradis au coeur de Rome! Small apartment, but great for 2 people, with everything you need and a superb balcony. Great location. Fantastic value for money. This was our second time in 'our' Roman home. It suites us perfectly in every way. This time I was recuperating from a hospital stay and so the terrace was a splendid place to be, with book, glass of wine whatever. We also managed to have friends for supper on the terrace a number of times, what a pleasure, and with Ruggeri and the Campo downstairs it couldn't be easier. Enzo was there to meet us and we only hope that his medical problem is a thing of the past. We locked ourselves out one morning, but, thanks to a friendly American with a computer, the proximity of the offices and the friendly owner, we were sorted in less than an hour! Vous avons réservé 8 nuits en octobre. L'arrivée fut difficile car Enzo qui devait nous accueillir était ce matin là à l'hôpital! La personne qui l'a remplacé n'était pas à l'heure convenue et nous avons dû attendre dans la petite ruelle avec 4 valises, les sacs...Mais il s'agit des charmes du voyage et nous avons finalement pris possession de l'appartement avec un léger décalage. Celui-ci est très bien situé, bien équipé (produits de base, nous en avons aussi laissé à notre départ). Malgré la présence du marché et le bruit inhérent, l'appartement est très "vivable" pour le sommeil. Les marches maintenant. Oui, cela devient une préoccupation au retour des longues balades dans Rome, 4 "vrais" étages, 9 paliers.... Mais si vous êtes en pleine forme pas de problème. Nous avons été incommodés par des odeurs prononcées de fumée de cigarettes provenant de l'appartement du dessous, tant dans la chambre à coucher que le salon. Nous avons dû fermer les fenêtres (le bruit du Campo devenait du fait même très assourdi). Je le répète, l'appartement est près de tout et hyper bien situé. S'il y a plus de deux personnes, il faut savoir que la seule toilette est accessible via le fond de la chambre à coucher en montant 3 marches très abruptes. La cuisine est petite selon les standards nord américains (Montréal) mais elle est fonctionnelle (pour deux personnes). Great location, close to many top Rome scenes. Solid mix of touristic and local events/poeple. The appartment is much smaller than the pictures lead us to believe, but the square footage is true, which we do not pay attention to...we should. Everything is functional, there are sufficient accessories which sometimes are missing: towels, paper, spices and other small things you hate missing. The appartment has them. My only questinable thing is heating which we could not solve...some nights in november were cold but we did without it. We recommend it 8/10 as long as North Americans like us (Canadians) find in small spaces the charm that we are looking for in Italy. Go for it! The apartment was clean, quiet and centrally located. Enzo communicated quickly with us and the check-in was very efficient. The apartment had everything we needed for the week. We would recommend this apartment to others. La posizione è perfetta per noi e senza problemi abbiamo ricevuto la chiave.Ci siamo stati due volte, in novembre e in maggio. Durante la nostra visita in maggio abbiamo goduto la terrazza. La sedia del WC è staccato-molto noioso. Ai piccoli tappetti manquano feltri-si scivola terribilmente. Sarebbe utile avere una cortina nella vasca da bagno per prendere la doccia. Per gli anziani puo essere difficile salire i 88 gradini. Ideale, bestens ausgestattete Wohung direkt im stimmungsvollen Zentrum von Rom. Die Lage ist einfach traumhaft, könnte nicht besser sein - sehr autentisch, zudem alles fußläufig erreichbar, tolle Geschäfte, Restaurants nur einen Katzensprung entfernt. Geräuschpegel hielt sich im März trotz der zentralen Lage direkt bei dem bis spät in die Nacht regen besuchtem Campo dei fori in Grenzen, man konnnte sehr gut schlafen. Wohung ist sehr hell und sonnig. Große , gemütliche Terrasse mit wundervoller Sicht über die Dächer der Altstadt von Rom. Man sieht nicht nur auf den campo dei fiori, sondern auch den Palazzo Farnese sowie den Palazzo spada. Sehr netter, sehr gut organisierter Empfang durch Roman reference und Enzo, alles klappte bestens. Werde diese Wohung bestimmt wieder wählen! This is indeed the most exellent place to stay when in Rome. We loved it from the moment we came. The rooms... the terrace... the view. Everything is nice and clean. There is everything you need. Enzo was there to welcome us. He introduced us to the appartment. He was very nice and gave us all the informations we needed. A wonderful apartment, great location. A wonderful terrace. Wi-fi worked well. The owner had taken care of everything. the apartment was everything we hoped it would be. The climb up 4 flights of stairs was worth it to sit on the terrace and enjoy Rome and the Campo below...a glass of wine in hand, supper cooked in the splendidly equipped kitchen (including coffee/salt/sugar/oil - often not included in holiday lets)...what more could we want? The bed is a tad soft and the bedroom is not big but we didn't care...the terrace (and the location) made it a perfect place. Enzo was there to meet us and explain how it all worked. The appartment was at an excellent location and to be able to sit outside is great! To have Wifi and AC is a great plus also. Climbing the stairs was no problem. It can be a bit noisy at night, but after a day strolling in Rome I got so tired, I didn't hear it ;-) A bit of AC in the bedroom would be nice. I would definitely stay here again and recommend it to you all! All contact with Cities Reference was very smooth and clear. This apartment is a jewel. Lots of stairs and the gate make it very secure so you can rest easy. The terrace is wonderful for sipping coffee or wine or taking a meal. The view peeking at the Campo dei Fiori is great. Be warned this is a bustling place. The market in the morning is a great place to stock your kitchen and the music from the night life is fun and not too loud. We walked everywhere in Rome and found this a perfect location for hitting most of the famous sites. The apartment was very clean, airy and the wi-fi good enough for streaming movies. Also we were very grateful for the AC which was quiet and effective when the afternoons became hot and humid. It was also nice to have the option to open all the windows and shutters to catch a morning breeze. We would stay in this apartment again for sure. It was worth the money. Only catch is the via is very narrow and hard for airport shuttle to get to. Be sure to tell your driver to allow extra time to park outside the square and walk in! Ciao and enjoy your stay in #1007 and all that Rome has to offer. The apartment was exactly as pictured on the site. It was in a great central location for seeing all the sites of Rome. The terrace was a beautiful place to sit and enjoy a rest and some sun. As detailed on the site, there are a lot of stairs to climb so be aware of that. I would definitely stay there again. Soggiorno indimenticabile nel cuore di Roma, location fantastica, appartamento delizioso e romantico con un terrazzo gradevolissimo, pulizia e cortesia al top! Lovely apartment, full of light and very clean. From the terrace you can admire a magnificent sunset view over the roof of ancient Rome. The appartement's location is very central, you can go anyweher walking. Great wecome.